Round 6 of the League was held at the South East Regional Championships in Ellens Green near Horsham. With a number of contenders featuring among the 30-odd riders who took the start line, we were going to be in for a hot race on this warm sunny afternoon. There were in fact three competitions taking place within the race - the competition to win the race outright, the competition to be the South East Regional Champion. With riders from different regions also taking part, it wouldn't necessarily be the winning rider who would become the SE Champion. Finally, there was the competition to become London women's league leader. Coming into the race, league leader Maryka Sennema (Kingston Wheelers) had a 12 point lead on second placed Elise Sherwell (Pearson Cycles). The race, which had seen a fierce battle for the finish line, ended with the Pearsons rider finishing in 3rd place, ahead of the former Ironman triathlete. So, while Sherwell succeeded in trimming down Sennema's lead, this wasn't enough for her to reclaim the leader's jersey. Maryka is therefore still the leader, but holds on by just 6 points. It remains to be seen what will happen at the next round, Hog Hill on 3rd June. Thanks to Kingston Phoenix and Glyn Durrant at British Cycling South East Region for helping to put on a successful race. The overall race was won by Lucy Chittenden (East Street Cycles) with Claire Galloway (Team Zappi) finishing second, and Elise Sherwell (Pearson Cycles) completing the podium. Lucy Chittenden was also crowned South East Champion. The runner-up was Elise Sherwell, while Claire Beaumont (Rapha Condor) completed the podium. 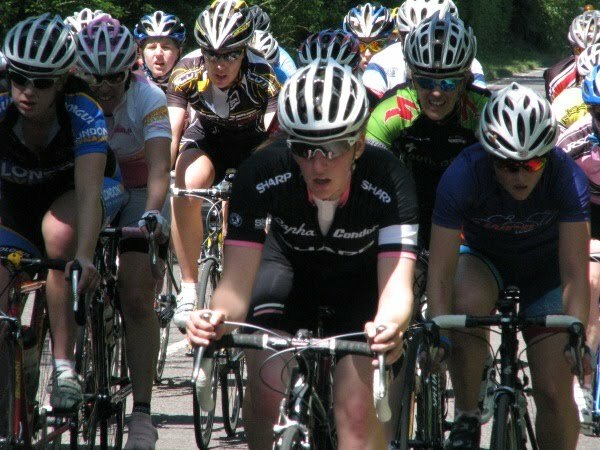 Thirty five riders lined up under a hot Surrey sun for the 2010 edition of the Women’s South East Road Race championships on Saturday, 22nd May. Roads were quiet and the pace of the race began at a fairly low tempo as riders had been advised of poor road surfaces on some parts of the course. After two laps, the riders were settled in and Emily Bagnall (Kingston Wheelers) started the attacking and was joined by Claire Beaumont (Rapha Condor) and Nikki Juniper (Ciclos Uno). With five laps to go, it was a testament to the good legs in the chasing peloton that the break wasn’t able to escape. Soon after, attacks came thick and fast with a representation from all the main teams including Zappi's, Rapha Condor, Kingston Wheelers and Pearsons. Nikki Juniper (Ciclos Uno) was one of the main drivers of the race along with Maryka Sennema (Kingston Wheelers) and as they tried to force breaks with other teams as did Rapha Condor. Assistant Rapha Condor DS James Duguid explained "We had two girls riding today, our other London based riders are recovering from injury and Katie Fearnhough is away in Belgium. The girls had to work with each other to force breaks but also if they wanted the race to progress, they needed to be alert and bring back breaks. I'm very pleased the way they were prominently placed and kept alert. Women's racing has moved along, I think thanks to some recent great racing at the Cheshire Classic and Horizon Fitness working hard at the Bedford 2 day." Into the final laps and the flat course profile meant that the split was not going to happen. The riders realised that a bunch sprint would decide the race and the attack subsided. With one lap to go, Clare Galloway of team Zappi stepped up the pace and strung out the rest once more, wearing down riders legs and reducing the group to around 20 riders who would be left to contest the final sprint. Into the final bend, there was a kick from Team Zappi and Emma Patterson (London Dynamo) as the sprint wound up from quite a way out. 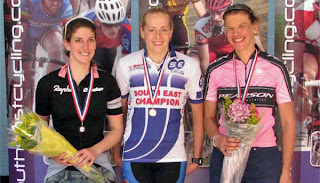 The eventual winner of the South East Champs title was Lucy Chittenham with Pearson's Elise Sherwell claiming second over Rapha Condor's Claire Beaumont. 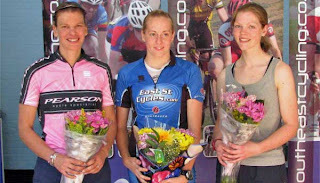 Claire commented after the race "I couldn't have ridden without teammate Rachel. We worked really well together and covered the attacks, kept out of trouble and thanks to her I was able to hold my position in the bunch and for the sprint. To hear about Kristian's win in Japan the morning before the race was great and motivated us to ride hard this afternoon."